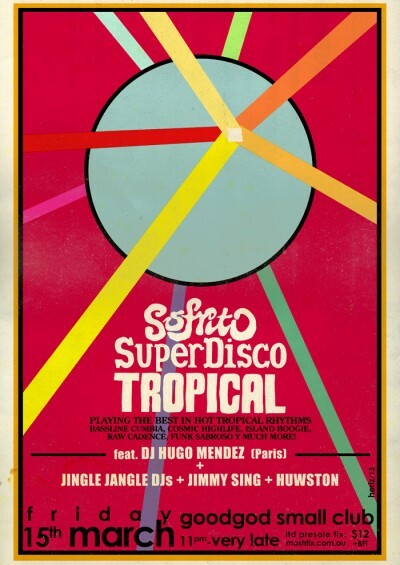 As a founder of London’s legendary Sofrito Tropical Warehouse parties, DJ Hugo Mendez sits at the forefront of Europe’s ‘tropical funk’ dance scene. Updating classic African, Caribbean and Latin rhythms with contemporary club sounds, the result is a percussive explosion. For one night only, Niche Productions and Goodgod bring the tropical vibes to Sydney with DJ, Label Boss, and Music Researcher, Hugo Mendez – a founding member of the Sofrito crew. Joining Mendez on the night are Sydney’s own purveyors and pro’s of tropical treats: Jingle Jangle; Jimmy Sing; and Huwston. Don’t miss out on this very special late night engagement featuring some of the most exoctic sounds you’re likely to hear this year! Check this bunch of Sofrito mixes to get you in the mood!